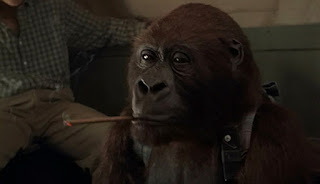 Whenever someone thinks of a movie revolving around killer animals, usually the first creatures that come to mind are poisons spiders, deadly snakes and raging sharks, but for today’s movie I’ll be highlighting killer Gorilla’s. 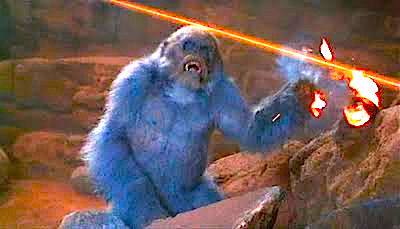 While Gorilla’s have been featured in classic movies like “Planet of the Apes” and “Mighty Joe Young”, they’ve never really joined the ranks of popular Hollywood monsters. Well ... with the exception of “King Kong”, but he was a giant, and that gave him an advantage. I’m talking about regular sized Gorilla’s, which in real life aren’t the most freighting animals in the world, but I suppose they can be relatively dangerous, at least when provoked. 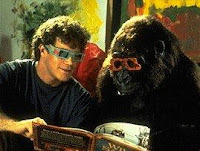 The 1995 movie titled “Congo” is one of the few monster movies to feature Gorilla’s as threatening movie monsters. It’s based on the novel by Michael Crichton, the same talent that wrote “Jurassic Park”, but this is a very loose adaption. The book was much darker in tone, where as the movie goes for campy B movie entertainment, and the result is an admittedly stupid, but mostly entertaining film. As you’d expect from the title, our adventure takes place in the African Congo, and revolves around a group of explorers who are all after something individually. There’s a woman named Dr. Ross who’s in search of her missing fiancé, there’s a greedy archeologist on a quest to find a temple that holds a valuable diamond, and finally there’s a scientist who’s determined to return his pet Gorilla named Amy back to the place of her berth. It’s a rocky yet productive venture at first, but things get really serious when they become the prey to a group of silver haired Gorilla’s that kill humans and other apes for sport. While none of the characters are really that great, there is a very talented and respectful cast here. Dr. Ross is played by Laura Linney, and while she doesn’t have much to work with, she’s clearly trying to put her all in what she’s got. Bruce Campbell of “Evil Dead” fame makes an appearance, and while he doesn’t do much, it’s always great to see him in silly B monster movies like this. The lead scientist played by Dylan Walsh has little to do, and is arguably the weakest character in the film. Then there’s Tim Curry as the Romanian Philanthropist who’s out for diamonds, and while I’m a huge fan of the actor, this unfortunately is one of his weakest performances. Having said that, I do find myself busting a gut laughing at how over the top-silly both his accent and performance is. The best actor in this movie by far is Ernie Hudson who plays the teams expert guide named Munro Kelly. This guy is simply made of awesome, and I’d gladly follow him on an expedition into the unknown. Ernie Hudson is just an incredibly gifted actor who’s extremely charismatic, and a lot of fun to watch. 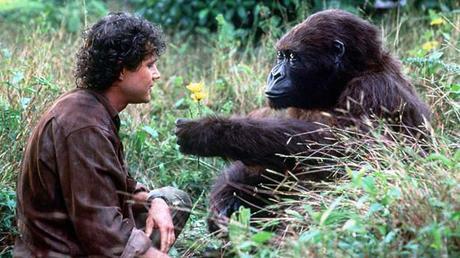 The worst character in this movie by far is the pet Gorilla named Amy. It’s bad enough that it’s clearly an actor in a bad ape costume, but the character is made even worse because she wears an electronic glove that allows her to speak English. The voice is annoying, and her mannerism is beyond stupid. She belches out loud, wears 3D glasses, annoyingly asks to be tickled all the time, and there’s even a scene in which she smokes a cigar. It’s one of the stupidest things you could possibly have in a jungle themed adventure movie, and the electronics on the apes face make it look like she’s enjoying that cigar a little too much. Yeah, there are a lot of really dumb scenes in this film, and most of them revolve around this stupid gorilla and her power glove. 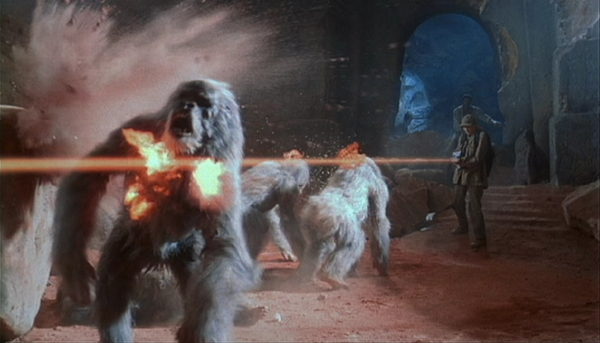 The creature effects in this movie were done by Stan Winston, and he usually hits it out of the park with his monster visuals. 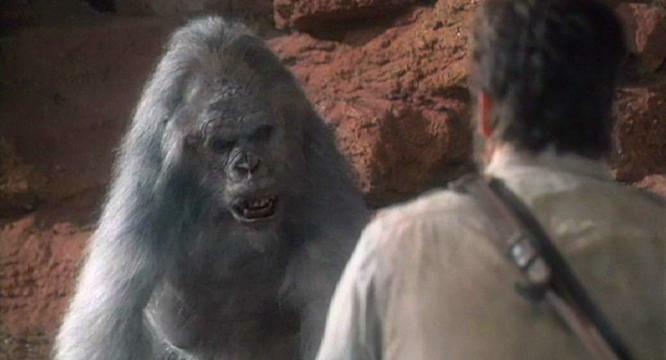 While the Gorilla’s are obviously people in costumes, I do still like overall designs of the savage killer Gorilla’s once they make their appearance. 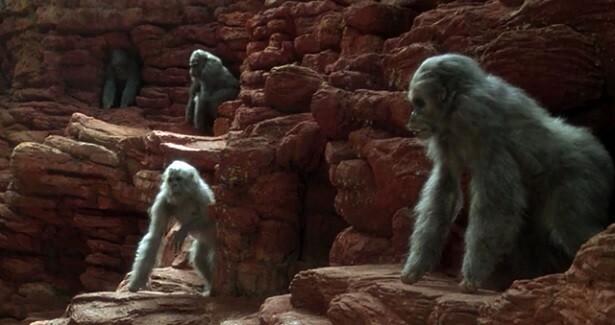 Giving the Gorilla’s a furry Grey-albino makeover was a nice touch, and gave them a creepy edge. Now, I’m not going to lie, it takes a long time before we see any of the Gorilla’s attack. The wait is worth it because the ape action is actually pretty sweet. I mean, it’s not high class entertainment or anything that special, but for this kind of film, it’s perfectly serviceable. 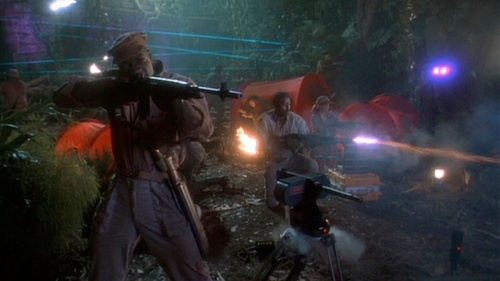 There’s a scene when they attack a camp, and our hero’s fight back with heavy weapons, and mechanical machine guns mounted on tripods. Kind of reminds me of the ones seen in “Aliens”. There are also laser guns, and laser nets on display that also look like belong in a 1950’s Sci-Fi movie. Sense the Gorillas can leap high, and climb all over their terrine, they can transcend to all out action better than most other movie animals which are usually restricted by their natural form and capabilities. This is also a very nice looking movie, with good cinematography and some beautiful shots of Africa. The Jungle setting kind of becomes a character in of itself, and I do enjoy the variety of things that our hero’s encounter on their expedition. 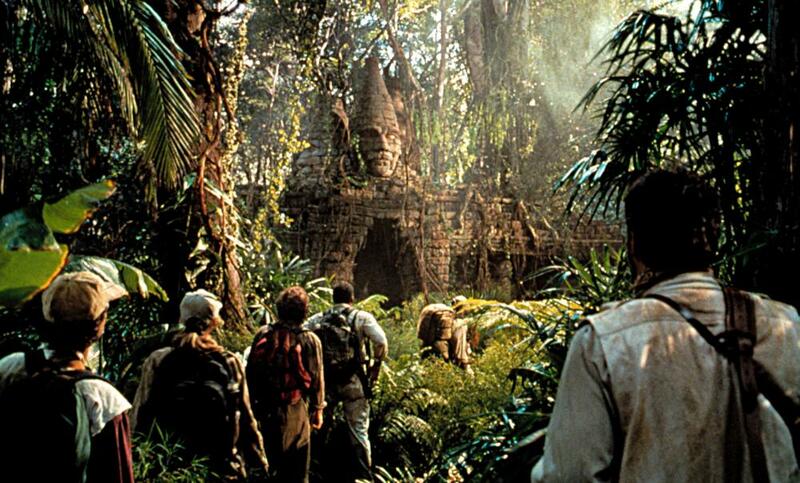 There’s an African ghost tribe, a lost city that looks like it came right out of Rudyard Kipling’s “The Jungle Book”, and there’s other dangers like a scene in which their attacked by hippo’s. The music is composed by the late great Jerry Goldsmith, who’s always been one of my favorite composers, and while this isn’t one of his best tracks, it does give the location some atmosphere. The climax is excellent, probably even one of my favorite finales to any animal attack movie I’ve ever seen. 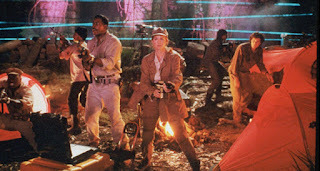 Our team venture deeper into the mysterious Jungle city and find an underground mine, and its here that Dr. Ross finds a diamond that can power her high-tech, ape zapping laser gun. What follows is an all out ape attack, as the grey Gorillas emerge from their caves, and take lives without mercy. 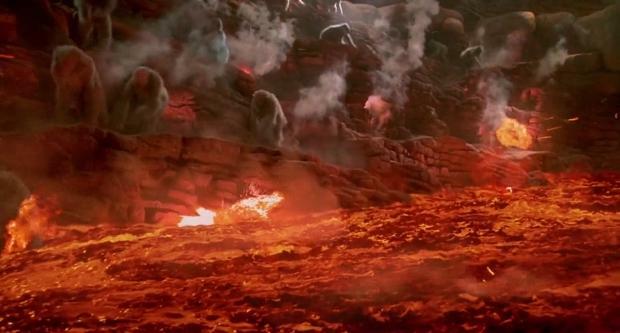 There’s energy weapons going off, Gorilla’s leaping all over the place, a super volcano erupts beneath them, rivers of lava flowing everywhere, temples collapsing, lots of destruction, and it’s just a wild ride. 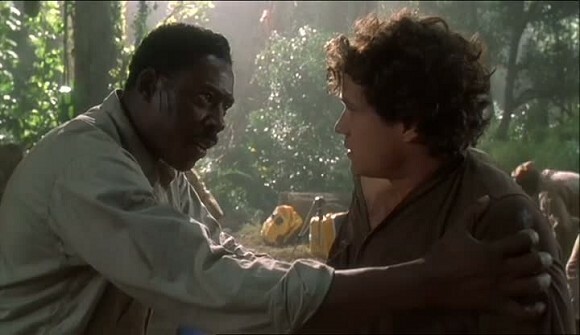 In the end, “Congo” is a campy jungle adventure with intentionally stupid scenes, laughable dialogue, and mildly impressive excitement. It’s by no means a good movie, but to be honest it’s actually a really fun film. 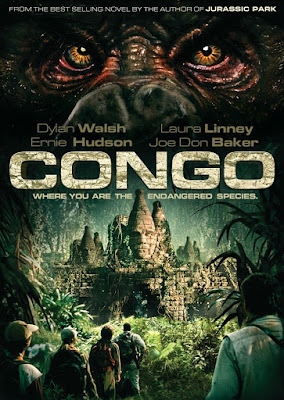 There are obviously better adventure movies that I’d recommend over this, but for what it is, “Congo” is a mostly inoffensive diversion. While some of the stupid scenes can be hard to swallow, the Gorilla action is exciting, the B movie charms hit all the right notes, the cast can be really amusing at times, and it’s by no means a boring experience. If you can get a laugh from silly B monster movies, then give this film a watch, but if you’re not a fan of the genera, skip this and watch “Jurassic Park” instead. 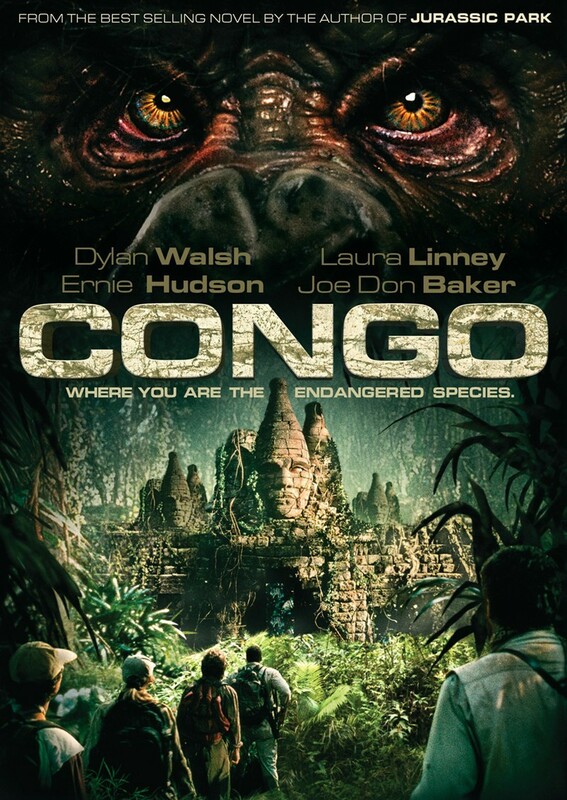 I give “Congo” 2 ½ stars out of 5.